Built in 1980, by the Greenville Shipbuilding Corporation of Greenville, Mississippi (hull #61) as the Don for the Greenville Shipbuilding Corporation of Greenville, Mississippi. In 1982, the tug was acquired by Coastal Towing Incorporated of Houston, Texas. Where she was renamed as the M.B. Freeman. In 1995, she was acquired by the TPT Transportation Company of Baton Rouge, Louisiana. Where the tug was renamed as the City of Freeport. 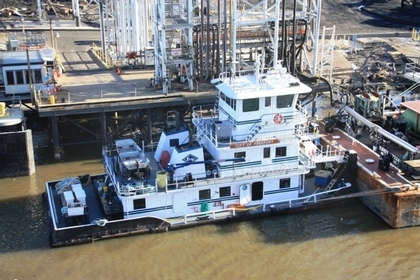 In 1998, the tug was acquired by the Kirby Corporation of Channelview, Texas. Where she retained her name. In 2018, the Kirby Corporation renamed the tug as the Freeport. Powered by two, GM 12V-149 diesel engines. With Twin Disc reduction gears, at a ratio of 6:1. She is a twin screw, towboat, rated at 1,350 horsepower.